when hotfooting the wife, her name on petition is suffice? don't have pics of her nor personal concerns. You know what kills me? Is that at one point I had a picture of the both them but I deleted it! Urghhhh. never thought I would need it and this lady is NO where to be found on the internet! I read the link and I can write her name 9 times on the petition bit it is considered the weakest link. Doing it anyway ....wish me luck! To make it less hurtful for the othergirl as I get my ex back, what spell would you suggest so that I can help her just find a new person or return to a former lover? If I understand you right you want to do a four part moving candle spell. With your intended being drawn to you while the other person being drawn to their ideal lover. You'll see a three part moving candle spell. Add a fourth candle to represent the ideal lover for the person you're sending away to move towards. ConjureMan Ali wrote: Clarity is also great to help someone see how bad a relationship really is for them to assess their true motives for staying. Hi i am about to perform the LM break up spell and i seen you talk about clarity. Is this a LM product? The female involved in my seperation work is the problem. The man wants to go hes miserable but shes the one who is stubborn. Their marriage is a mess and she needs to open her eyes to this instead of hanging onto what isnt there anymore and hasnt been for a long time. Any suggestions as to how i can work on the female to get her to let go and walk away? Skull candle with Clarity Oil can help her see that the marriage is dead and no longer good for her. ConjureMan Ali wrote: Skull candle with Clarity Oil can help her see that the marriage is dead and no longer good for her. I have found a uk stockist of LM products. The shop has a white candle skull and a black skull and crossbones candles. Which skull should i use with the clarity oil to make the wife see her marriage is dead? Also when i get these products is there any words i should be saying for performing my spell? Or do i just anoint the candle with the clarity oil and focus my intentions of her seeing the truth about her marriage? Sorry for all the questions but i just want to make sure i am doing all this right. hi, my situation is very complicated, the man I have feelings for has been married to his wife for almost 3 years but they've been high school sweethearts for over 10 years, I don't know what to try that will work, they were engaged once before they got married but he called it off and broke up with her because he found out that she cheated on him with his own brother but they eventually made up and got back together and got married obviously, and now a lot of people that talk to him and see him more than I do are saying that she's cheated on him again, I heard they were separated but she's been seen with him recently and I don't know if that's true or not, he works all the time and is never at home and his work requires a lot of travel so I don't know how he found out she cheated on him again unless he's got someone watching her for him that's close to her, luckily though that don't have any children, yet. oh and btw, he's cheated on her too with a ton of women, I don't know if he still is or not now that they're married but you know old habits die hard right? I don't have any experience with any types of spells, should I try and do it on my own or get someone else to do it for me? I'm worried I won't find anybody honest that will help me but I don't understand why they won't, there's no children involved that I know of, it shouldn't be too difficult and he has feelings for me, I want her out of the picture, I just feel like she keeps pulling him back and won't let him go, or she's doing some kind of work on him I don't know about, help! Breaking up a marriage is a "hard" job and not one that every rootworker does, because marriage is a bond before God and should not be toyed with lightly. I would get a reading from a professional rootworker to see a)is there potential for a long term relationship withithis guy? b)would a Break Up spell be effective in this case? My personal advice after reading your description: once a cheater, always a cheater. With the world population at seven billion, there is no one person that you must have. Your statement that you'd "walk over hot coals for him" tells me you are obsessed with him. Yes, it is possible to break up his marriage, but that doesn't mean he will come running to you. He may have a whole string of women to turn to. My advice is to Cut and Clear to remove any feelings toward him. Well, we can only go by your written words, and without being able to hear your tone of voice or "smileys", it sounds like you'll do anything to get this man to be with you. We as Hoodoo practitioners wouldn't be ethical if we didn't teach about all the sides of that possible Break Up work: yes, it may be possible to do this work and have it succeed, but you should go into it eyes wide open. It's kind of like the dog who keeps chasing cars...what will he do with it when he catches one? I'm not desperate for him to be with me but I do know he has feelings for me, don't get me wrong, I would love for him to be with me but I would rather just try and encourage him if he has feelings for me instead of pulling him away, that's what one of his good friends told me, what should I do? or what would be my best approach? I have been dating someone for a year who is still technically married. No they dont live together or see eachother. However they share custody of their child and that's really their only communication over the past several years. The problem is there seems to be some financial issue as to why the paperwork was never filed. He is afraid she will nail him to the wall financially and take everything (Ive already had a reading about this confirming this) My AIRR rootworker even informed that it looks like he'll at least try to get the paperwork signed by the end of the year. But hello, we are in February, thats 10 months away. My question is how can I speed up this process without causing a fight between them and making things worse? I have nothing against his wife and have no need to do a breakup spell that would cause enmity between them. All I want is for them to just sign the paperwork ad stop procrastinating. He tells me its something he has to do, but he never seems to make it a priority because of this financial thing and also because I think he hates for people to not like him. Hotfoot is out of the question as they share a child and I would never jeopardize that. I almost think that road opener, crucible of courage, and separation products might be the best bet, but I am looking for some additional opinions. You can try some Crucible of Courage products on him, to get him to grow a backbone and finish filing the papers. I'd get the oil and add it to his shampoo and toiletries, praying your petition into it. You can also get the sachet powder and dust the inside of his shoes. Separation products are for a more peaceful break up. In addition to this, take a look at law products- especially honey jar kits- to get the law on his side when it's time for paperwork. He shouldn't need anything extravagant- just fair so that he isn't "nailed to the wall." The law products to start on would be Court Case, Tobacco products, and Justo Juez (Just Judge). Here are the kits, I would get together a legal game plan with your reader for things to work in your SO's favor; think of those 10 months as a blessing as you'll have over a year to get this spiritual ball rolling. You Could use break up items on them both as well as crossing on her, and draw his attention in the direction of another partner with love products, or use compelling products on him. Well, what are her weaknesses? One is she is mentally weaker. So you may be able to penetrate her through dreaming work, or skull candle work. I would work a skull candle to perhaps get into her mind to become more angry when she sees him, or telling her she is not happy with him. I would go with a break up spell kit. It comes with everything you need, and it comes with a break up bottle. I find that proximity is the BEST way to get a couple to argue. So if you can bury it at the couples home as close as you can...that would be great. If they do not live in the same place then bury it at one of their homes. Mix some break up powder and dirt and sprinkle it in their paths, send them a letter lightly dusted with break up powder,etc. I really like the bottle spell though because it holds the energy, and Ive had great success with this method the most when it comes to breaking up couples. Do you want to break them up or do you want to curse her? If you want her to suffer that is one thing, But if you want to break them up that is another. I would stick to the break up spell kit. Start with that and the honey jar. Going out with her friends and being in other people's business isnt going to do anything necessarily to their relationship unless it bothers him. That brings me to another point, what does he not like about her? I would exploit that too. You may have to get a reading to find that out. Thanks Stars.. I emailed ConjureMan To go through the steps on getting reading etc. It is a complicated story.. I am the total opposite of her. she is angry, insecure, liar, controlling . Where I on other hand have patience, unconditional love, trust etc when it comes to him. Yes I want the Break up.. and willing to do even if it takes time and alot of work..
Have you had the most success using the Breakup bottle spell or the Breakup kit? I like the letter dusted with Break Up powder idea. I may use that. I have to send a dear friend some papers to look over anyway and her boyfriend is also controlling. He is out of town right now, although she is going on vacation with him in 2 weeks. Maybe I will dust it Tuesday and send it out Wednesday. 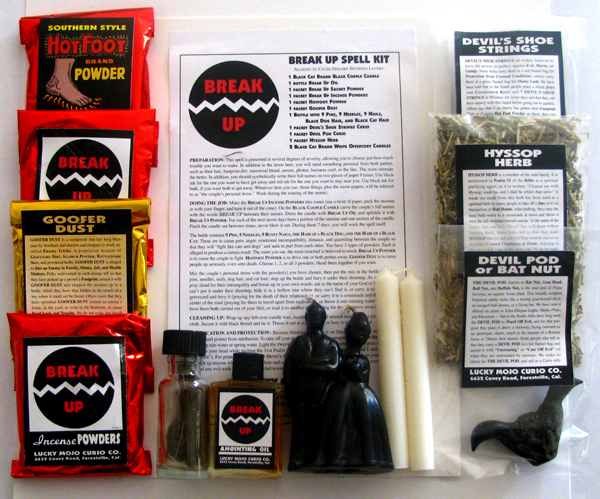 Well, the break up bottle comes in a break up spell kit. But the break up bottle just alone is pretty effective for me. I tend to burn candles on top of them, and then shake them often. They are even more effective if I can bury the bottle on one of the parties properties or if they live together. But I think the break up spell kit is just great because it comes with everything you need. You can use the powders to sprinkle in their path, put on their car door handles, etc. Thanks Stars. If you send a letter to your target dusted with break up powder, will they be able to see the powder on the letter? You have to shake the powder off. I like to use a cheap make up brush to help me dust it on the paper. Wow, that's interesting to know. Thank you very much and Starsinthesky for your help and tipping me off to these little tricks. Hi there, I hav been reading this, hope u don't mind me asking this. Am doing a lemon jar with my & my husbands name in it, in hope tat he moves out & away from me. I put al those goodies in there & shake often, my ? Is, should I put hotfoot in the jar too? Thank u so much mag. No, no, don't hotfoot yourself! Only put his name in there with the hotfoot powder. You've got enough problems without crossing yourself up. Thanks so much Professor, one last thing, if I decide 2 bury it in our yard, because we both still under the same roof, does it matter if I step on it or any of the other stuff tat am throwing out there. Work the jar for a while (9 days or while the moon is waning would be two options), then take that down to a river that flows out of town and pour it out and rinse the bottle out. You could also pour it at a crossroads that leads out of town, but I don't think I'd bury it at home. I don't bury any negative work at home. Some of these spells above are for breaking up another couple or moving someone out that doesn't live with you and you'd bury the stuff at their house, under their steps, etc. Or with break-ups, you'd put both names in there, but since you are the other part involved you want to think about just him being affected and moving away. Keep yourself out of the jar and away from the hotfoot. Thank u so much Professor! I posted this question on another area, but think this may be a better place. I too used the hot foot in my vinergar jar and realize it was not the best option. I want to start over but i am confused on how to get rid of this jar ONLY because I messed up and not because I was finished with it or ready to finish the work. I have been praying for several days w/ the conviction that they will fight and break up, but still I would like to dispose of this jar and re-do w/ out the hot foot powder. I have read over how to ritually dispose of a vinegar jar conrrectly, but it doesn't seem that anything i have read covers just wanting to get rid of it becaused I messed it up. Crossroad, running water, burrial, burning.. none of these methods make sense at this time since I'm just trying to get rid of it due to a mistake from adding the hot foot. I am new at this so any clarification so that I do this respectfully and properly would be very appreciated. I'm worried now because the last thing I want to do is push him away. I want her to go FAR FAR away once and for all.. but keep him here. Like I said on the other place I posted this question on the forum.. he and I love each other.. but this lady has a hold on him that no one can explain. I don't even think he understans it. From a reading I had with Ms. Cat last week, apparently she has done some "work" on him.. this would be the only thing that could explain this misterious attraction to this bad person (even when Ms. Cat laid the cards, the first card she put down for her was the devil card). Help please.. I want my family back..
My brother in law married a woman that I have extreme bad feelings about, she was his best friends fiancé. The brother in law had his own fiancé, in less than 2 weeks he decided he wanted the new girl. I feel she did something, I wish to break whatever spell she cast. I am not the only family member that feels malice coming from her, nor am I the only one that wants her out of the family. What they have is not true love, if it was i wouldn't bother asking for advise, but he cheated on the now wife up until a month before he proposed with the ex that he still cared for. Any help, spells, or words of wisdom is appreciated. If you really feel this way, you can order the Breakup kit. It has everything you need. Mama Micki wrote: If you really feel this way, you can order the Breakup kit. It has everything you need. You can purchase it right here on the forum! Will it be powerful enough to break any spell she has cast to win her ill gotten husband? crmsnpheonix1 wrote: Will it be powerful enough to break any spell she has cast to win her ill gotten husband? If you need some more detials on how to go about doing this. The best thing to do now is to get a reading from a Professional Practitioner. THANK ALL OF YOU! I am planning on doing a crossroads spell breaker to break the spells she cast upon him, then bind her from doing anymore magic on him, and finally the divorce spell within the kit. Hi, I am involved with a married man. We've been seeing each other for six months. Things are going so well that he thinks about leaving his wife. Well, most of the time. Anyway, he told me that he would seriously consider it except that it would also mean leaving his kids, which he does not want to do. I respect that and think he's a great father but I would also like us to have our happiness. I would support him with custody, care, visitation, whatever. Can you please recommend a spell, products, anything that would get him to consider the option? I'm not asking for him to leave or abandon his kids, but something that would get him to consider being a part-time dad so that we could be together as well. thank you. Hi, I'm currently seeing a married man. I keep a vigil candle burning on his name 24/7, work a honey jar, have a nation sack and periodically add different variations of Come to Me type spells to the mix. I'm also doing break-up work, in a justified manner, on the marriage. It is going very well but I find there is a lot of two steps forward, one step back stuff going on. One day he's all over me and can barely contain himself before we meet again and the following week he seems practically complacent. Any suggestions on how to keep the energy steady, less volatile, so I dont have to keep working my way out of the set backs? I'm trying to build momentum but feel like the energy sort of wears itself out prompting me to do the next trick. Please do not start new threads on the same topic. I put your two posts together. Did you have a reading to tell you that this work is justified and that is worth your time, money, and energy? It is difficult to break up a marriage, and even if you do succeed, there is no guarantee that he will come running to you. Right now he is having his cake and eating it too. Thanks but I purposely started two different threads because it is two different topics, although I understand on the same target. The question on the kids is a question specific to my case. The question on keeping energy steady is a question more to hoodoo in general. Could you kindly separate? I did have a reading, thanks, and this course of action was recommended. I always do justified work by asking that the work be a success only if approved in the eyes of God. No, it's the same topic. You want to break up his marriage and for him to accept spending less time with the kids. Topics are merged to give people a better idea of your situation and to keep the Forum better organized. I'd suggest setting a time limit for this work. Two threads on the same job can confuse the issue. I appreciate seeing all your posts in one thread, Steel, so I can wrap my mind around all the issues involved. It does sound like a complex situation, possibly even more complex than you describe; you might want to consider a reading with one of the fine folks at AIRR. This sounds like it needs more personal attention than you can get on a public forum. I agree with Mama Micki and Miss Michaele that it's a lot easier to give you the specific information and support you deserve when the entire issue is in the same place. I also agree with Miss Michaele that getting a reading to look at all of the different components affecting such a difficult situation would be well advised. A reading can also look at the most effective work to get the outcome moving in your direction. A moving candle break-up spell comes to mind as a good way to work. Skull candle work is another good way to go since it works directly on his mind. Another idea would be to but the kids, him and you in a honey jar all together so that the ''new family structure'' starts being a sweetened ASAP. That said, given the wealth of manners in which the situation can be approached, that reading is the priority. An AIRR member can also back up your work if you so desire thus acting as a ''double-whammy'' if you will. I'm just gonna weigh in here in favour of merging the threads you started because both of them are about your married man situation. Thanks, Miss Cat. That is where I posted my second question but let's leave it here then since everyone agrees more information is better. I'll search that section for help though. Along those lines, this is my story. I reconnected with my first love after over 20 years. He has tried to contact me a few times over these twenty years but I would never allow myself to see him again because my feelings for him remained unresolved and I was certain he must have moved on. I figured I was being ridiculous so I finally saw him but as it turned out his feelings were unresolved as well. We started seeing each other immediately. He is, however, married with children. I have had a couple readings but the focus of the readings have always been about our relationship or the relationship between him and his wife, thinking that was the issue. I have since found out, though, directly from him that the real issue is that he will not abandon his kids, which I can understand. So I'm asking for suggestions on how to open a man to the possibility of another woman when it means leaving his kids. Any suggestions? and aura, thank you. What oils and herbs would you use? I've never met his kids, of course, do you still think a honey jar is the way to go? I would make it my business to get pictures of the kids and get to meet them as soon as possible. Keeping you "secret" from the kids means he may not leave the wife -- just like a man who won't bring a woman home to meet his mother will rarely marry the woman. Greetings Steel. May I recommend a reading with a Member of AIRR to you, please. Thanks, Tammie. I've had readings and have one coming up in a couple weeks. I hear you Miss Cat. I doubt he'd introduce me, though, to his kids because they're little and would report back home to mom that they were with dad and another girl. So I dont see him doing it. He sends me pictures, though. Most divorces are filed by women; most men seem content with having a wife at home and a girlfriend on the side. Use a white skull candle representing the wife and dress it with Influence or Commanding and Court Case. Write a petition on the candle or a piece of paper under the candle telling her to file. She may be thinking about it anyway. I knew a guy who couldn't make up his mind whether he wanted to stay or go, and his wife put the divorce papers under the Christmas tree. Thanks for that Mama Micki. Interestingly enough, it dawned on me only today that I've been going about this all wrong. I've been working on him this whole time but started wondering today if I should really be working on her and getting her to take action. So thanks for that confirmation of thought! and the papers under the tree - poor guy, that's rough!